Welcome readers to ‘White Noise,’ Issue #12 of The Quarry, Macquarie University’s journal of student writing! This issue showcases the diversity of talent that is the 2018 Capstone class for the undergraduate Creative Writing major. For many of us this was our last undergraduate class, and it was hard not to feel a little nostalgic walking into class for the last time. But the familiarity of the faces reminded me how far we’ve all come, and the friendships generated out of this degree. Three years ago we were all strangers, nervous to share our writing with each other. Now, having seen each other grow through workshopping and feedback, each writer has developed an idiosyncratic style and voice. We have come together as friends, writers and peers to present this issue to you. 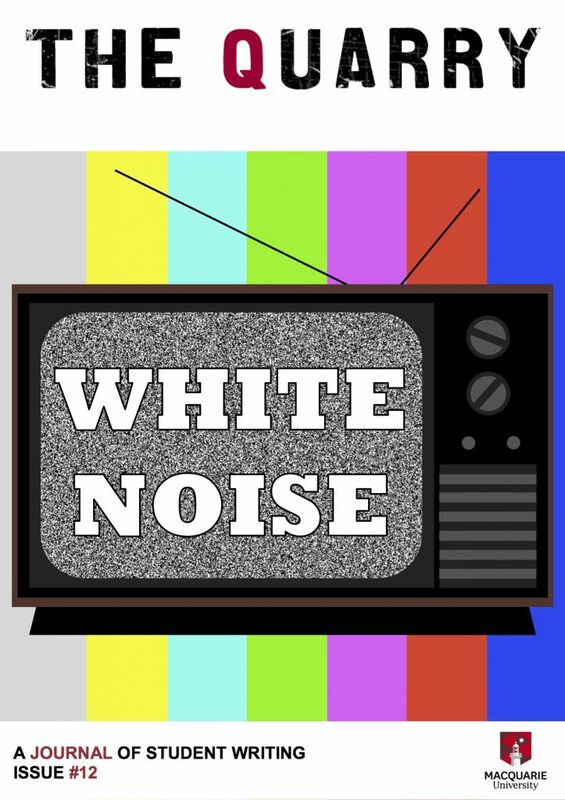 White Noise is the combination of all audible sounds, 20,000 simultaneous tones. It is named after white light, which is light comprised of all different frequencies. As a class comprised of so many distinct voices and styles, it made sense to pick a theme that represented all of us. That’s how we landed on White Noise as our theme. It is the combination of all of our styles, connected by theme. With our writing we hoped to bring details from the background into the foreground and present subtext that bubbles to the surface. But White Noise also has a masking property, able to drown out voices in a torrent of others. It can be easy to hide in the background when you’re one voice among many. Or when you’re quiet and the world is loud. This issue is comprised of fiction, poetry, creative nonfiction, and poetry-fiction hybrid pieces. Some of our fiction writers are Domenica Seminara and Amelia Pike, who actualise the fear that the person we trust most can betray us. Beatrice Phan depicts the dangers of recreating the past with technology, while Salvatore Pedavoli reminds us there is always hope, if we can only get out of our own heads. Deng-Shan Lee and Emily Shaw have penned heartfelt tales where comfort comes from the most unlikely of places. If you have ever wished there was life in outer space, I recommend you embark on a journey with Josef Pringle in his imagining of the life of the Voyager II probe. Laura Bax, our Creative Nonfiction writer, investigates how corporate abuse of her local environment has impacted on her family life, and shaped her relationship with her home. In poetry, Sam Moon reminds us that things exist beyond our perception, and that we belong to something primal and older than humanity. Masumi Parmar describes the problem of conveying pain through language. The only language able to communicate pain is metaphor. Alexander Lafazanis provides a humorous rumination on the concept of bottled water and the damage we inflict on the environment for convenience. The Quarry is a platform for everyone, and avoids privileging one voice over another. This issue hopes to function like a rainbow for white light, separating light into it’s component colours. Issue 12 filters through the White Noise, breaking the sound down into its component voices. Whichever stories you read, regardless how disparate they seem, they have each been crafted with the same passion and form part of the whole that is the class of 2018. Our cohort is deeply indebted to Jane Messer, Willo Drummond, Michelle Hamadache, and many more, for their invaluable feedback and guidance throughout this learning process. From all the writers and editors of Issue #12, we hope you enjoy our stories. Happy reading.